William Horace (Horrie) was the only son of William and Elizabeth Cooke, of Tungkillo. He was born 1893. He had completed his apprenticeship as a wheelwright, but was frequently seen riding one of the earliest motorbikes to appear in the Tungkillo district. Horrie enlisted at Adelaide on 26th April 1916. He was 22 years and 10 months old. He was 5’4”, weighed 126 lbs, with brown hair and brown eyes. He listed his religion as Methodist. Horrie left from Melbourne aboard the “Baramba” on 27th June 1916 and arrived in Plymouth on 25th August. He was sent to France arriving on 1st November. On 11th November 1916 he was admitted to hospital suffering from mumps and orchitis. He was back in the field by 20th December. On 16th February 1917 he suffered from gas poisoning, and was admitted to the 45th Casualty Clearing Station. He rejoined his Unit on 30th April. On 16th September 1917 he sprained his ankle and was sent to a rest camp. He again rejoined his Unit on 26th October. He was allowed a fortnight’s leave, which he spent in England from 23rd November to 10th December. On 31st March 1918 he was returned to England suffering laryngitis. He stayed until 15th June and then returned to his Unit. 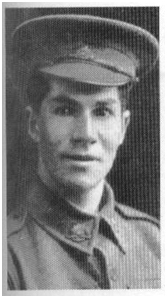 Horrie was killed in action on 29th September, 1918. His paybook was retrieved from his body by stretcher bearers the next day, and he was buried along with others soldiers in the open field. A will was made by Horrie and signed on 12th June 1916, a fortnight before enlisting. He left a block of land in Tungkillo, his life assurance money and his stock in trade to his father.